Adam Trent (Heavener) is a mild-mannered ex-cop who is now a businessman. He thought he left the unpredictable and violent world of the streets behind him. It turns out he was wrong, because Trent becomes the unwitting and unwilling participant in something called “The Game”. He’s truly having the worst birthday ever - not only is he thinking about the troubles in his past, he now has to fight for his life. Run by the sinister Lindsay (Von Franckenstein of American Ninja V (1993) and Lionheart, 1990) and his son Winters (Norton), the two operate a betting parlor out of a castle in Hollywood. Patrons bet on how long “the target” will live, meanwhile goons are chasing after him with guns at every turn. They even have a serum they can inject into you to track your movements. But Trent proves too clever and outwits them, utilizing his favorite tactics, those of shooting, punching and kicking, and maybe a few blow-ups along the way. Will Adam Trent survive to drink one of his uncle Billy’s (Windom) fruit-and-beer milkshakes again? Not to be confused with Hard Target (1993) - no, wait - TO be confused with Hard Target, Heavener has fashioned a cross between that movie and The Game (1997) even though Fugitive X pre-dated The Game by a year! We’re definitely fans of Mr. Heavener - we keep coming back to his movies because we admire his talent - he acts in, writes, directs, produces and does the music for the majority of his movies. And this is one of the more professional-looking outings we’ve seen from him to date. Yes, there is some clunkiness here and there, what with awkward fight staging, odd-looking muzzle flashes and explosions and maybe a boom mic or two, but Heavener is basically single-handedly releasing decent-to-good direct-to-video B-movie product, and it is very impressive. Fugitive X: Innocent Target could have been a UPN show in the 90’s like The Point Man, The Lazarus Man, or any number of their action-based shows. Although it is somewhat surprising that this came out in ‘96, it looks like it could have been released in ‘87 or earlier. It even pre-dates the online gambling craze, because that’s pretty much what people are doing in this movie. It should also be said that Fug X (as we call it) is highly repetitive, most of the running time is spent on baddies chasing Heavener, and Heavener eluding them. Even still, the goons have ample chances to shoot Trent, but fail constantly. They must have a fear of success. Heavener jumps on the “slicked-back hair” craze for action stars of the 90’s, unfortunately started by Steven Seagal, and wears a tuxedo for a large part of the movie. So there’s plenty of silliness to go around. Robert Z’Dar is here looking even odder than usual with long hair and a homemade-looking shirt that says “Love Child”. Why they felt the need to put him in a shirt that says this is unknown. Also inexplicably, footage from his one scene ended up in the later Heavener movie Outlaw Prophet (2001). Chris Mitchum has a nothing role as a cop. Blink and you’ll miss him. As anyone who reads this site knows, we’re huge Richard Norton fans, and he does a decent job as Winters, but this isn’t the best Norton movie. It’s also kind of funny how Lindsay’s son is Australian but Lindsay isn’t. It’s nice to see all these B-movie names together, but Mitchum and Z’Dar needed more screen time, and Norton a meatier role. Plus, similar to the infamous “He’s gone AOL” line from Direct Contact (2009), at one point Heavener says the line “is there a police station around here?” but he slurs his words and speaks quickly so it sounds like he says “Is there a PlayStation around here?” Either that, or that IS what he said. It was the mid-90’s after all. PlayStation 1 was huge. Maybe he wanted to play Crash Bandicoot to relieve some of his stress. 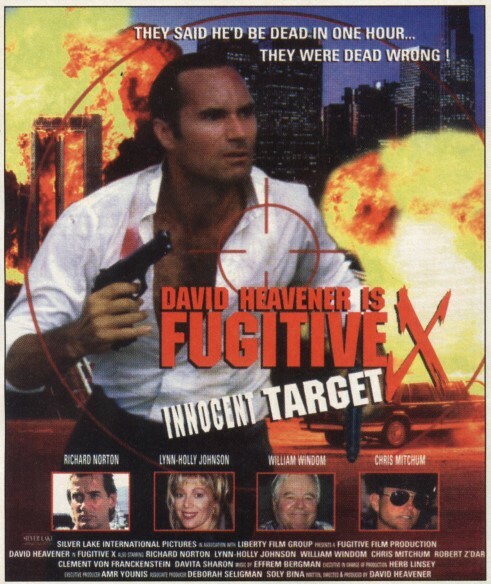 For an entertainingly dumb DTV outing using some of the favorite themes of the 90’s, Fugitive X: Innocent Target is more than watchable. Your review was spot-on. Why does Norton always end up in small roles like this? Norton needs to have more lead roles...or at least be on TV in a fun martial arts show. Is it just me or does David look like Thomas Ian Griffith here on this cover?